I was born in 1975, part of Generation X, probably the last generation whose parents felt comfortable sending their kids out into the neighborhood after school. “Go outside and be back by dinner,” was a common directive from my mother. Behind my house was an undeveloped hill, and “The Hill” was where my sisters and I went when my mom sent us outdoors. My childhood was also filled with Girl Scouts, dance classes, and community soccer, but my best memories and my most formative experiences come from the times my mother wanted nothing more than to get me and my sisters out of her hair for a few hours. The Hill was totally open to our interpretation and needs: it was a place where we could try to make sense of a complex world by reconstructing it on a smaller scale. On The Hill we were sometimes brave explorers and other times victims in need of rescue. The Hill was whatever we needed it to be. A growing body of research in early childhood development is revealing the critical connection between this type of exposure to nature and the developing brain. Children who spend immersive time playing in nature tend to be less anxious and better able to focus, and to have fewer health issues and more emotional resilience, than children who don’t. Nature play allows children to choose their own adventure, based on the amount of challenge and risk they feel ready to take on at any given time. Should I walk across that log? What will happen if I balance these three sticks? I want to move this tree stump, can I carry it myself? Do I need help to move it? Experiences like these are how children build awareness and confidence in their abilities and decision making. We want our children to have lots of these experiences before they become teens and begin making decisions with more consequences. The best nature play occurs in places that are near the home, easy for children to get to on a regular basis. Most people have access to some form of nature, the trouble is that often people don’t “see” the nature in their communities. For a child, nature can be very small – playing in the dirt sheltered by a bush or playing among the roots of a tree. Rain, snow, dirt, rocks and sticks are basic elements of nature that provide excellent opportunities for play. Creating works of art with mud, building snow forts, jumping in puddles, building with sticks and rocks – the possibilities are boundless. Children’s attraction to nature is instinctive; nature is the primary biological context for our cognitive and physical development. Our brains have evolved to be responsive to the natural world. Technology and our culture have evolved far more rapidly than our brains. Our brains still respond with fear and disgust to spiders and snakes, despite the fact that people are statistically more likely to die from an automobile than a spider. Our brains still drive us to be attracted to homes near water, despite the fact that in the developed world we can get water in any home simply by turning on the tap. Nature (on any scale) fires up a child’s developing brain in a way nothing else can, and the benefits last well into adulthood. 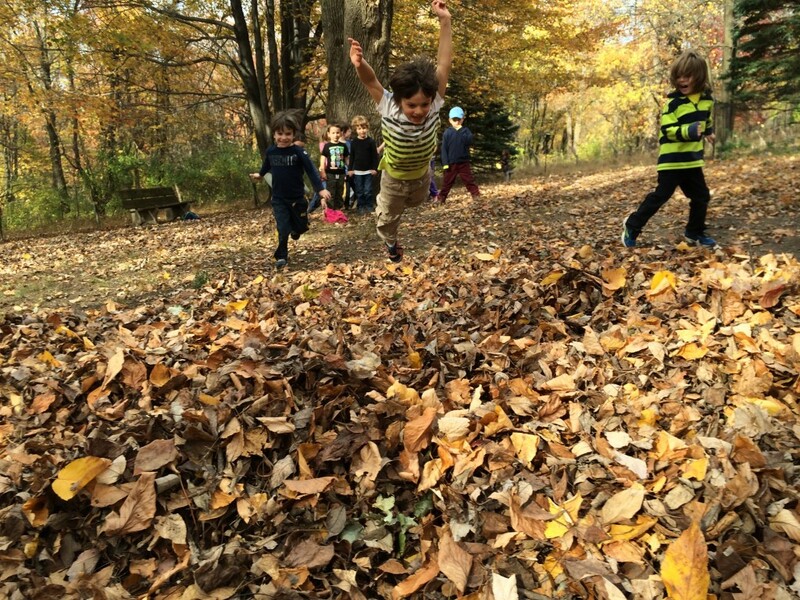 Playing in autumn leaves in childhood offers a joyful play opportunity and that rich sensory experience becomes linked with the emotions of that play. When that child becomes an adult, the earthy smell of autumn leaves, the way they crinkle and crumble under your touch, the colors against the ground, these sights, smells and sounds carry with them those positive feelings from their childhood. When I think back to my childhood, The Hill dominates my memories. In reality, I probably spent less time on The Hill than I did at soccer, Girl Scouts, and dance. It is the power of nature play, linking rich sensory experiences with high emotional stimuli, that makes my childhood experiences on The Hill loom large in my memory. Every child needs a special nature place, big or small, that meets them where they are and gives them what they need. And every adult needs to have that special nature place in their heart, connecting them with feelings of peace and joy, whenever they might need it. This piece was first published on the blog of the Community Design Collaborative on November 11, 2015.